To some people, solving crossword puzzles means sitting in your favorite chair with a folded-over section of the newspaper and a pencil (or a pen if you’re really brave) with a cup of tea by your side. To others, it’s less about the ritual and the tactile sensation of paper than keeping the mind working during downtime. If you’re more of the latter, then Magmic’s The New York Times Crosswords Daily 2009 app may be just up your alley. It offers access to the daily crossword puzzles from the New York Times, as well as the publication’s vast archives of more than 4,000 puzzles going back to October 1996. And yes, the ‘2009’ in the product’s title is significant, as it’s only good until the end of this year. Getting started with a day’s puzzle is easy—from the main menu, you tap on Play and then on Today’s Puzzle. Getting to archived puzzles is a little more difficult. You click on the Calendar link at the bottom of the same page, which takes you to a month-by-month calendar—you can tap on arrows to move forward or back in the months as well as the years. The problem I had was that tapping on a square to download an older puzzle caused the Downloading progress indicator to come up, but the app didn't download the puzzle. In order for it to work, I had to tap on the next day, which would then cause the previous day’s square to turn blue, at which point I could then select that original day and download the puzzle. You can pinch to zoom into specific areas to enlarge them, making it easier to see what you’re typing. Tapping on the clue bar above the on-screen keyboard toggles between across and down clues for your current location. You can also tap on a clue button at the top to see the clues and boxes in a list, and you can enter your answers in this view as well. While solving, you can bring up a menu to check letters, words, or the entire puzzle, as well as reveal letters, words, or the entire puzzle when you’ve reached your wit’s end. When you’re done with a puzzle, you can also check your answers. The app also includes social features for competing and interacting with other users, as well as tracking your individual stats for puzzle completion times (which explains the timer at the top of the screen when you’re working on a puzzle). The app gives you a fair amount of control over its interface. You can choose whether to put the toolbar on the top or bottom of the screen, pick from three sizes for clues as well as for the keyboard—very useful, since it can be hard to enter clues with anything other than the large keyboard size—and have the app remember the level of zoom you last used when opening a new puzzle. You can also set whether you want the app to skip filled squares as you’re typing, and to automatically jump to the next clue when you finish entering a word. Unfortunately, you can’t turn off the timer if you just want to enjoy a relaxing brain teaser. At $10, it’s a good deal, considering that it costs $7 a month or $40 a year for a New York Times Premium Crosswords subscription (or you get it for free with a subscription to the Times itself). But the app doesn’t have anything to do with that subscription, so the $10 will be on top of anything you already pay. If you already have access to the puzzles online, and would like to solve them on your iPhone as well, you might want to make a one-time purchase of Eliza Block’s $6 2 Across or Stand Alone’s $10 Crosswords apps, both of which let you enter your Times puzzle information and download and solve daily puzzles. And with a regular puzzle subscription, you can also solve puzzles online, download them to solve on your computer, or print them out. 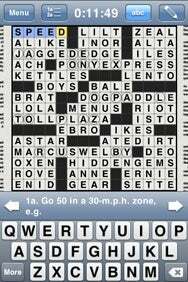 The New York Times Crosswords Daily 2009 is compatible with any iPhone or iPod touch running the iPhone 2.2 software update.